As required by the Fire Safety Order 2005, blocks of flats or properties containing common parts of two or more dwellings must have valid Fire Risk Assessments completed. The responsibility is down to the management company looking after the property or the freeholders when self-managed. If in doubt, always speak to professionally trained fire safety assessors who are experienced in completing Fire Risk Assessments, to be sure whether or not your property or the property managed is in need of one. In a nutshell, Fire Risk Assessments are structured methodical checks of premises and the activities conducted within, that could cause fire putting the safety of occupants at risk. 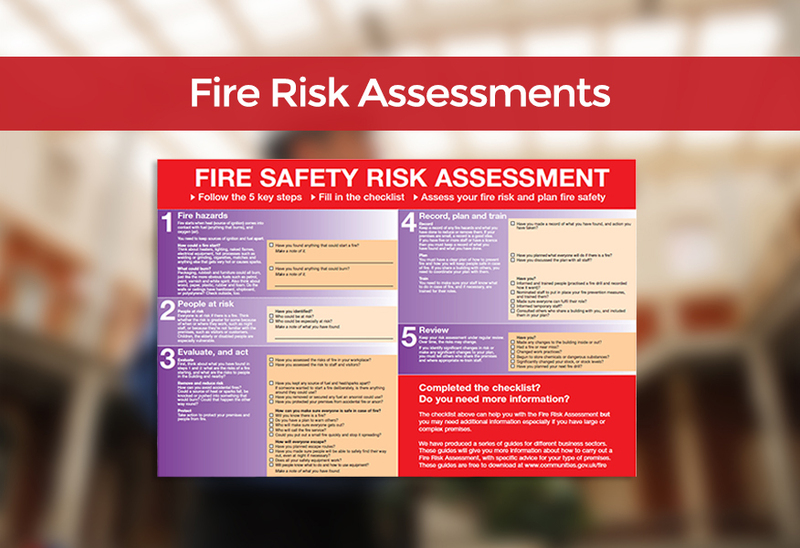 The core process of Fire Risk Assessments include the following three main points. A methodical and thorough look at the fire hazards throughout a property including communal areas, to include: all entry/exit routes, internal and external door structures, building structural checks including roof, emergency lighting needs, fire extinguisher needs, etc. There are checks you can do yourself, to identify what you should be looking for, read the 5 common causes of electrical fires in homes. Identifying those at risk in case of fire is a potentially life-saving activity that must be completed during an assessment. In residential properties, people to consider are those who are living alone, anyone with mobility difficulties or use a wheelchair to mobilise, and lastly, those in the immediate surrounding area. A record of the current fire detection devices, fire alarm sounders and fire alarm panels (a full design proposal) should be in hand of the management company or at least with the installation/servicing company who look after the fire detection system. Also, it is advised that a regular maintenance inspection of the system is complete to not only prolong system functionality but to ensure its working at full capacity. 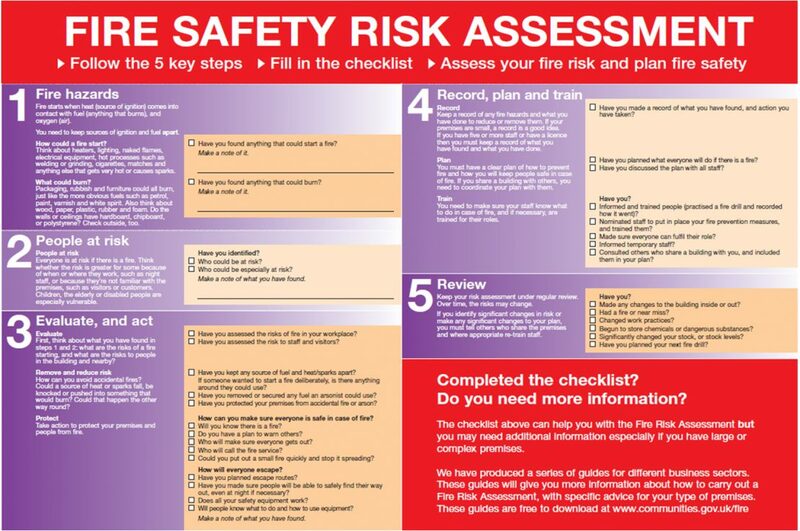 Fire Risk Assessments should always be documented and signed off by a professionally accredited company, and for the larger flat blocks, it’s recommended to keep a fire safety log book with all the normal maintenance servicing and any concerns are recorded. Make sure fire safety is reviewed every year. How much do Fire Risk Assessments cost? For complete Fire Risk Assessments, which include actionable fire safety reports and plans signed off by your chosen fire system installation company, you’ll be looking at between £200-£500. These assessments are not only a regulatory requirement but they’re a sure-fire cost-effective way to ensure your property is best protected from fire – protecting those who live or work inside. Every property is different, however, so we would need a few important bits of information before providing a valid quotation. In this short informative video from the Fire Industry Association, you’ll learn how Fire Risk Assessments are approached in terms of theory and how they’re conducted in practice. Although this is focussed on how to assess commercial properties, it’s still very much applicable to landlords and management companies who are the responsible persons in blocks of flats and House in Multiple Occupation (HMOs). Protection is our main priority, we’re BAFE approved with an unblemished record on Checkatrade, so whether it’s deterring criminals with the presence of our burglar alarm systems or capturing key evidence with our CCTV cameras, all our systems are installed by qualified and trained installation staff with the utmost professionalism.